A scene from The Hunting Party. The trailer of The Hunting Party certainly built intrigue for the film. Interesting lines of dialogue, buildings blowing up, a news reporter and his cameraman right there in the fray covering wars from up close, Richard Gere [Images] continuing to age well, Terrence Howard looking earnest...it made me think that this might be an indie gem worth checking out. That the film was based on an Esquire magazine article was the first piece of information that bothered me about this movie. Mostly because a feature film based upon an article, no matter how long that article actually was, suffers from at least two degrees of separation from the truth. The truth will set you free sometimes, and sometimes it will just give a filmmaking team headaches in the editing room. Narrated by Duck (Howard), the movie tells the story of television journalist Simon Hunt (Gere) who was the star reporter for his network and had a ringside view of every single war, skirmish or conflict, anywhere in the world (that the network saw fit to cover). Duck served as Hunt's cameraman and together they get to watch as friends, neighbours and countrymen went about killing each other in the name of race or religion or some other 'idea' that eventually led to real loss of life, and extension of misery. After witnessing a particularly brutal example of ethnic cleansing by a warlord known only as The Fox (Ljubomir Karekes) Hunt gives up his journalistic neutrality on live television and as a result his career takes a swan dive, never to recover. Duck on the other hand gets promoted to a cushy job in New York. The main plot of the film revolves around Duck's return to Sarajevo five years after the end of the conflict and his surprise reconnecting with Hunt. The grizzled journalist is on a mission, he thinks he knows where Fox is hiding and with Duck's help he wants to score an interview with the mass murderer. Along for the ride (because he won't take 'no' for an answer) is young Benjamin Strauss (Jesse Eisenberg), the son of a network Vice President, who wants to prove himself strong enough to endanger his life on the field. Do they actually find the Fox? Is Simon really just motivated by a need to regain his position as a cutting edge journalist? Will they survive this seemingly foolhardy and deadly mission? These are the plot points the filmmakers attempt to communicate in an engaging manner. And enjoy middling success. The trouble with a movie like this starts with the 'based on a true story' part. The filmmakers might have started out with every intention to tell the truth but that intent and reality can be two very different animals. 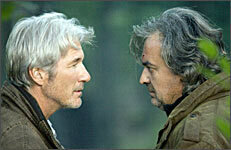 For one, the truth might not make for very engaging cinema. Second, the truth might be thwarted by the interests of whatever governments or international agencies are portrayed in a bad light in the film. Third, and possibly most important, audiences may simply not care about whatever happened in a faraway land. The Hunting Party suffers from at least two of the above stated problems. The performances are extremely competent. 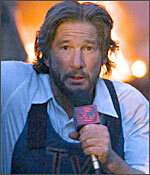 Since we already know of Richard Gere's activism it is not difficult to buy him as a reporter on a mission. Howard brings the same defeated earnestness to his portrayal of Duck that has served him well in movies like Crash and Iron Man yet he retains enough steel in his eyes to convey anger or irritation without resorting to unnecessary theatrics. Even Eisenberg, as the inexperienced intern, remains well enough in character throughout his role to take nothing away from the major performances in this film. So it isn't the performances, or the way this movie is shot (though it does make one wonder whether war-torn areas can really look as sunnily cheerful as a beach-set romantic comedy). Some of the editing choices are questionable like the sequence with the posse of a height-challenged gangster that seems wildly off plot to the rest of the movie. The reason why Hunt loses it on national television is the oldest reason in the world. The way the odd trio goes about trying to place themselves face-to-face with a known mass murderer appears farcical too often for the final message of this film to really sink in. And the actual resolution of the film is not wholly satisfying. So go watch this one if you're in the mood for shaking your head about the state of the world. But be warned that it is neither entertainment in the masala sense of the word nor is it truly 'message cinema' in the way that sub-genre has defined itself.